Jeeps are more than just a vehicle for many. Rather, they are a way of life, a lifestyle choice symbolizing freedom and ruggedness. They are also among the most modification friendly vehicles out there and a mechanic’s delight. One thing is for sure, jeeps can’t be your everyday grocery run vehicles but rather weekend stress buster tools. So today, we bring you another example of a custom made jeep which has been built from scratch. Take a look at the video below to see how good it is. This jeep has been custom built by the modifier as per the demand of his customer. This is not a Mahindra Thar with some modifications done as many of you may think. Actually, the vehicle is made from ground up and made to look like a Thar. Whatever be the case, it looks completely bonkers and has the features to match its looks. The chassis used is from a Mahindra MM550. The vehicle now gets a set of big butch tires and has a hard top roof. The front fascia includes Projector headlamps along with LED auxiliary lamps and a custom fitted bumper. The roof houses a LED light bar too. Then come the big side mirrors mounted from top making the car look more radical. The rear is majorly occupied by the big spare tire mounted on the tailgate. Apart from that, there are LED tail lights and turn flashers along with a roof spoiler. 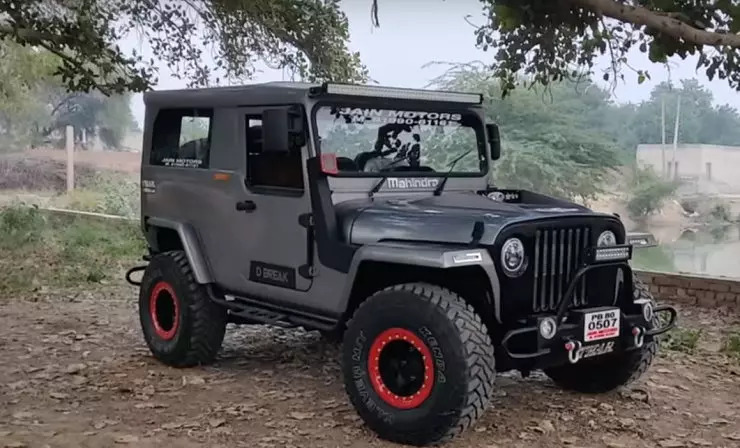 The engine used on this jeep is a stock Mahindra CRDe unit. The car also has a snorkel for air intake, making it more off road friendly. The interiors of the vehicle is also quite nicely done. There is a infotainment screen which takes up much of the centre dashboard area and also comes with parking cameras. The steering is powered and the interior design is same as that in the Thar. The Jeep also features a high end audio system with bass tube to rock things up. Front seats are fully adjustable and even have some powered functions. Other notable features include automatic sunroof, power windows, ambient lighting and many more. Also the car gets blue lightning to illuminate the road down under the car, for those who like to announce their arrival in style. The whole car is made for a sum of Rs. 8.5 Lakhs which includes all taxes and formalities. Upon ordering, such modification will take anything from four to five months time until it’s ready.